Hello guys, I'm a new owner of a 1946 2n. I've been getting all the serving books on this tracter. 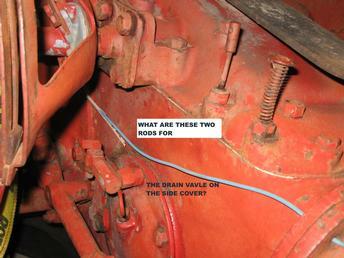 But I'm stumbed I'm hoping one of you will know what these 2 rods are for? I have not seen them in any of the books I've got I haven't pulled the covers do to the fact I don't what is hooked to what. Sorry how do you upload a photo? It's easy.. follow the links on the left and upload your pics... once uploaded hilight and copy the url that is provided under the pic... put that in the image url box under your message. Frazier........ah yes, the "secret" levers thru hollow bolts. When you lift up on the lever, you loose yer 3-point lift abilitiy. Why? 'cuz you've cut-off/blocked the hydraulic pressure. Not certain about the spring loaded lever, but I'm certain it is also related to the blocking lever. MOST LIKELY, the rod is for "up" on a simple trip bucket loader, and the spring-loaded button is for "down".